Notes: The stamps celebrated 100 Years of legistature for the protection of birds which makes this postmark and cachet of particular significance. This cover is in immaculate condition. 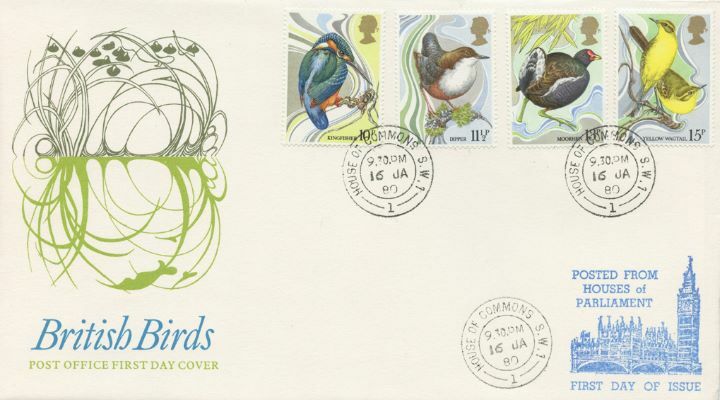 The above Royal Mail British Birds 1980 stamps were issued on 16 January 1980 by Royal Mail and feature the following stamp designs: 10p Kingfisher; 11 1/2p Dipper; 13p Moorhen; 15p Yellow Wagtail. The Posted from the Houses of Parliament first day cover with the House of Commons Special Handstamp postmark has been produced by Royal Mail/Post Office and features these stamps which can make a very collectible and lovely gift.